Fight for the Right: the Birmingham Suffragettes was an opportunity for young women living in Birmingham to explore the activities of both sides of the suffrage campaign, militant and non-militant, in Birmingham in the early 20th century. Female students aged 12-15 from two local schools, Kings Norton Girls’ and Waverley, investigated social and political change by exploring different ways of campaigning and protesting by women who wanted to gain the vote. 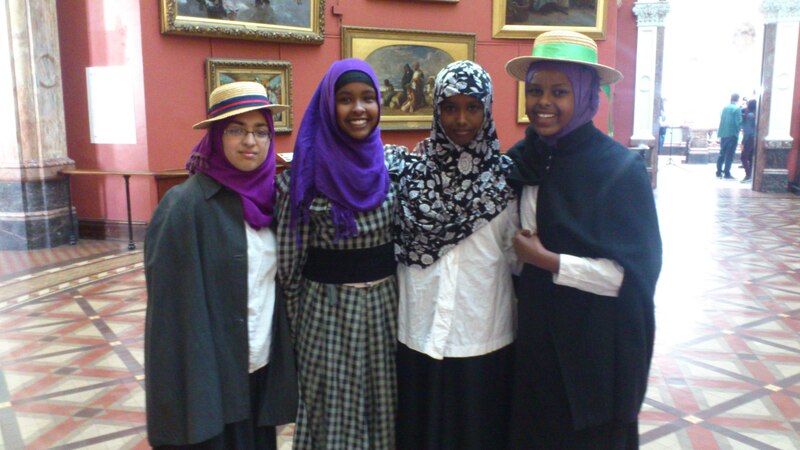 The young women involved in the project believe that the Birmingham suffragettes are an important part of their heritage. While some of those involved had some prior knowledge of the suffragettes, they knew very little about activities that took place in Birmingham: Fight for the Right aimed to re-dress the balance by exploring women’s voting history from a local perspective, focusing specifically on the activities of the Birmingham suffrage movement between 1909 and 1914. While primarily a history project, we also explored social and cultural change within women’s rights today, by encouraging these two diverse communities of young women to explore ideas about voting and politics. The project took place over a period of twelve months and was supported by the Heritage Lottery Fund. A series of workshops were delivered by myself as project manager, local historians, a film maker, a drama practitioner and Education staff from Birmingham Archives & Heritage. The project planned to interpret the knowledge gained through workshops and archival research where debate and campaigning formed the focus. 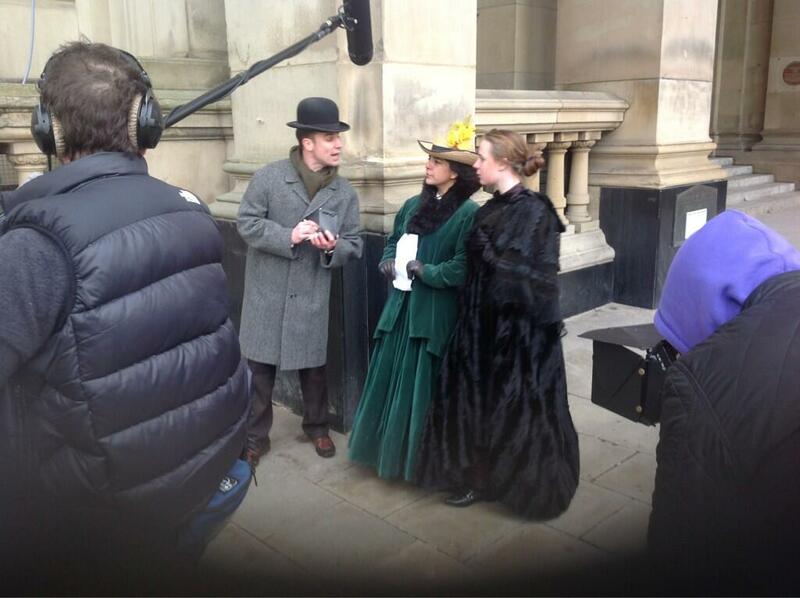 This led to the students scripting and filming a historical re-enactment film interpreting the Birmingham story and focusing on the activities of both the suffragettes and the suffragists. The project allowed us to research those events through local women and local actions, increasing a sense of connection between the participants and the past. We wanted to explore the hidden “herstories” that were not part of the students’ everyday learning, where the stories told often focus on a London-centric viewpoint and focused on the most famous protagonists. We wanted to know what happened in our own area. In a year of suffragette-related activity, Fight for the Right: the Birmingham Suffragettes seems to be unique in its focus on young women interpreting their own local history. Involvement in the project had a significant impact on the participants thinking about history, archive collections, women’s history, voting, politics and democracy. Evaluation questionnaires completed after the school screening events demonstrated that all either “strongly agreed” or “agreed” that they were: motivated to learn, self-confidence had improved, they had achieved a lot, creativity and imagination improved, and that they were able to think of new ideas. Blythe said, ‘I take interest now [in politics and news]’. She knew a bit about the suffragettes but didn’t realise there were two sides, ‘without either side none of them would have got the vote’. Nibah commented: ‘It strongly affected me to know a lot about history…at first I couldn’t even say the word ‘suffragette’…I hadn’t heard of them…I’ve now found out a lot’, ‘when I give my vote I’ll remember these women’. When asked what she would take from the project Ayah, who plays Catherine Osler in the film, replied ‘dignity’ and expressed how proud she felt to be a woman. Faisa, who plays the role of Hilda Burkitt, described how she was normally shy in class and would never volunteer for role playing but the project ‘really improved my self-confidence’. Aisha thinks it’s a waste to not use your vote and remarked that she will remember the project when she comes to vote. Ann McLeish (Deputy Head, Waverley School): ‘The girls were apathetic to politics in general at the beginning of the project and knew little about the history of women’s suffrage and the British political system, but this project has made them more aware of the importance of voting and has instilled a greater interest in the political system’. 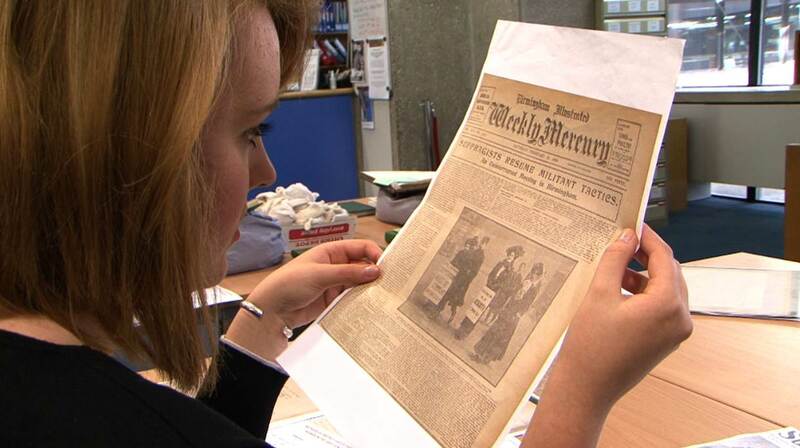 The project also had an impact in raising the profile of the Birmingham suffrage campaign and the city’s contribution to gaining votes for women as well as raising the profile of the archive collection amongst the participants. Nikki Thorpe (Birmingham Archives & Heritage): ‘From an archive partner point of view it was excellent to see the archives being used so inspiringly and creatively and already there are conversations with the schools and the project facilitators about how we can explore other aspects of women’s history using archive material’. Christina Thatcher (Head of History, Kings Norton Girls’ School): ‘The project exceeded my expectations. It enabled pupils to develop new skills, not just related to history, but also drama, media, communication and teamwork’. Juliet Raynsford (drama practitioner): ‘This was a project that exceeded any expectations that I had… A surprising aspect for me was the extent to which the students from Waverley School, who do not study drama as part of their curriculum, embraced the acting aspect of the project. These students worked very hard at capturing the essence of their characters. I was deeply moved by their performances upon first seeing the film’. 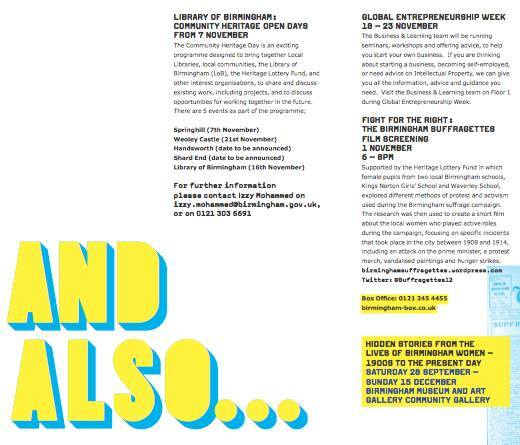 The film will be shown at the Library of Birmingham on November 1st from 6-8pm.